On March 7, 2019, we are shutting down the legacy Google+ APIs. This has been a progressive shutdown where calls to affected APIs began intermittently failing on January 28, 2019. Developers should have received one or more emails listing recently used Google+ API methods in their projects. Whether or not an email was received, we strongly encourage developers to search for and remove any affected dependencies on Google+ APIs from their applications. Note that we have built new implementations for several people.get and people.getOpenIdConnect APIs that are documented as belonging to the legacy Google+ APIs, including those listed above. The new implementations will only return basic fields necessary for sign-in functionality. More information can be found below. The Google+ Sign-in feature has been deprecated. Developers should migrate to the more comprehensive Google Sign-in authentication system. Over the Air Installs is now deprecated and has been shut down. To help mitigate the impact of the shut down, we have made the following changes to aspects of the Google+ APIs shutdown. If you would like to test your application with the shutdown behavior before March 7, you may do so by joining this Google Group with a test user and then trying your application as that user. Be sure to use only test with fake users and fake data. Do not test with your production user accounts or data. Note that you will see the new behavior for your fake users, regardless of which application you are testing with. We have created a new implementation of several people.get and people.getOpenIdConnect APIs that will only return basic fields necessary for sign-in functionality such as name and email address, if authorized by the user. The new implementation only allows an app to retrieve the profile of the signed-in user, and can return only basic profile fields necessary for user sign-in functionality. While we still recommend that developers migrate to alternative APIs such as Google Sign-in and Google People API, for cases where developers are unable to move over before March 7th, existing calls made to the legacy Google+ people.get and people.getOpenIdConnect APIs will automatically be served by this new implementation at the same HTTP endpoints as before. Likewise, requests for some OAuth scopes will no longer fail as previously communicated. In most cases scope requests such as those used for sign in and usage not related to Google+ will no longer return an error. However, other scopes that authorized access to Google+ data such as Circle and Stream information will still no longer be granted. See full outline of scope behavior here. While we strongly encourage developers to migrate to the more comprehensive Google Sign-in authentication system, for cases where developers are unable to move over before March 7th, scopes required for Google+ sign-in will now be remapped to existing Google Sign-in (not Google+) scopes, which should allow these legacy applications to continue to use Google+ Sign-in until they can migrate. We are working with third party developers to help manage the transition and may implement additional mitigations in limited cases where the issue would impact hundreds of thousands of users. For example, we may allow temporary access to legacy Google+ APIs for broken, non-social apps that are using the API primarily for sign-in purposes. Developers should still remove any dependencies on Google+ APIs from their applications as failure to do so will most likely break their applications. Developers may consider alternative APIs such as Google Sign-in and Google People API for their needs. Google+ integrations for web or mobile apps are also being shut down. Please see this additional notice. While we're sunsetting Google+ for consumers, we're investing in Google+ for enterprise organizations. They can expect a new look and new features -- more information is available in our blog post. Update: This posting was updated on February 28, 2019 with important, recent changes to aspects of the shutdown covering Google+ Sign-in, Google+ APIs, and Google+ OAuth scope requests. We recently launched the Google Home Hub, the first ever Made by Google smart speaker with a screen, and we knew that a lot of you would want to put these helpful devices in the kitchen—perhaps the most productive room in the house. With the Google Assistant built-in to the Home Hub, you can use your voice—or your hands—to multitask during meal time. You can manage your shopping list, map out your family calendar, create reminders for the week, and even help your kids out with their homework. To make the Google Assistant on the Home Hub even more helpful in the kitchen, we partnered with BuzzFeed's Tasty, the largest social food network in the world, to bring 2,000 of their step-by-step tutorials to the Assistant, adding to the tens of thousands of recipes already available. With Tasty on the Home Hub, you can search for recipes based on the ingredients you have in the pantry, your dietary restrictions, cuisine preferences and more. And once you find the right recipe, Tasty will walk you through each recipe with instructional videos and step-by-step guidance. Tasty's Action shows off how brands can combine voice with visuals to create next-generation experiences for our smart homes. We asked Sami Simon, Product Manager for BuzzFeed Media Brands, a few questions about building for the Google Assistant and we hope you'll find some inspiration for how you can combine voice and touch for the new category of devices in our homes. What additive value do you see for your users by building an Action for the Google Assistant that's different from an app or YouTube video series, for example? We all know that feeling when you have your hands in a bowl of ground meat and you realize you have to tap the app to go to the next step or unpause the YouTube video you were watching (I can attest to random food smudges all over my phone and computer for this very reason!). With our Action, people can use the Google Assistant to get a helping hand while cooking, navigating a Tasty recipe just by using their voice. Without having to break the flow of rolling out dough or chopping an onion, we can now guide people on what to expect next in their cooking process. What's more, with the Google Home Hub, which has the added bonus of a display screen, home chefs can also quickly glance at the video instructions for extra guidance. The Google Home Hub gives users all of Google, in their home, at a glance. What advantages do you see for Tasty in being a part of voice-enabled devices in the home? The Assistant on the Google Home Hub enhances the Tasty experience in the kitchen, making it easier than ever for home chefs to cook Tasty recipes, either by utilizing voice commands or the screen display. 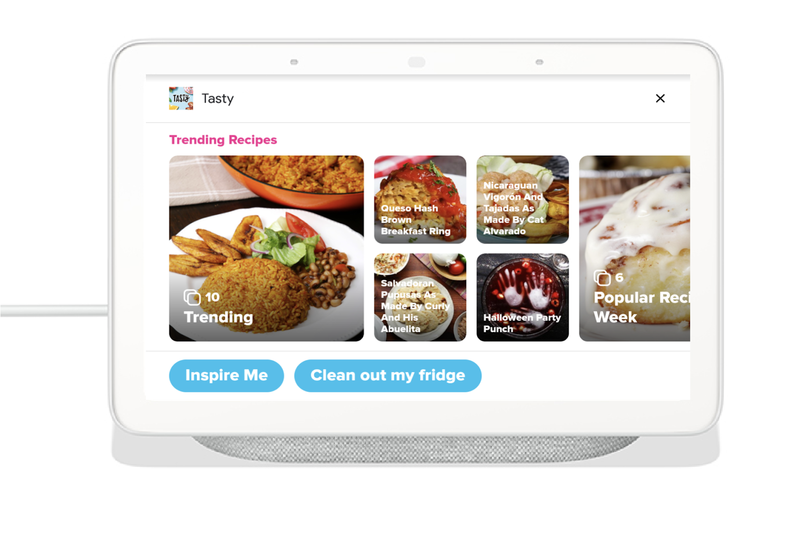 Tasty is already the centerpiece of the kitchen, and with the Google Home Hub integration, we have the opportunity to provide additional value to our audience. For instance, we've introduced features like Clean Out My Fridge where users share their available ingredients and Tasty recommends what to cook. We're so excited that we can seamlessly provide inspiration and coaching to all home chefs and make cooking even more accessible. How do you think these new devices will shape the future of digital assistance? How did you think through when to use voice and visual components in your Action? In our day-to-day lives, we don't necessarily think critically about the best way to receive information in a given instance, but this project challenged us to create the optimal cooking experience. Ultimately we designed the Action to be voice-first to harness the power of the Assistant. We then layered in the supplemental visuals to make the cooking experience even easier and make searching our recipe catalogue more fun. For instance, if you're busy stir frying, all the pertinent information would be read aloud to you, and if you wanted to quickly check what this might look like, we also provide the visual as additional guidance. Can you elaborate on 1-3 key findings that your team discovered while testing the Action for the Home Hub? Tasty's lens on cooking is to provide a fun and accessible experience in the kitchen, which we wanted to have come across with the Action. We developed a personality profile for Tasty with the mission of connecting with chefs of all levels, which served as a guide for making decisions about the Action. For instance, once we defined the voice of Tasty, we knew how to keep the dialogue conversational in order to better resonate with our audience. Additionally, while most people have had some experience with digital assistants, their knowledge of how assistants work and ways that they use them vary wildly from person to person. When we did user testing, we realized that unlike designing UX for a website, there weren't as many common design patterns we could rely on. Keeping this in mind helped us to continuously ensure that our user paths were as clear as possible and that we always provided users support if they got lost or confused. What are you most excited about for the future of digital assistance and branded experiences there? Where do you foresee this ecosystem going? I'm really excited for people to discover more use cases we haven't even dreamed of yet. We've thoroughly explored practical applications of the Assistant, so I'm eager to see how we can develop more creative Actions and evolve how we think about digital assistants. As the Assistant will only get smarter and better at predicting people's behavior, I'm looking forward to seeing the growth of helpful and innovative Actions, and applying those to Tasty's mission to make cooking even more accessible. What's next for Tasty and your Action? What additional opportunities do you foresee for your brand in digital assistance or conversational interfaces? We are proud of how our Action leverages the Google Assistant to enhance the cooking experience for our audience, and excited for how we can evolve the feature set in the future. The Tasty brand has evolved its videos beyond our popular top-down recipe format. It would be an awesome opportunity to expand our Action to incorporate the full breadth of the Tasty brand, such as our creative long-form programming or extended cooking tutorials, so we can continue helping people feel more comfortable in the kitchen. To check out Tasty's Action yourself, just say "Hey Google, ask Tasty what I should make for dinner" on your Home Hub or Smart Display. And to learn more about the solutions we have for businesses, take a look at our Assistant Business site to get started building for the Google Assistant. If you don't have the resources to build in-house, you can also work with our talented partners that have already built Actions for all types of use cases. To make it even easier to find the perfect partner, we recently launched a new website that shows these agencies on a map with more details about how to get in touch. And if you're an agency already building Actions, we'd love to hear from you. Just reach out here and we'll see if we can offer some help along the way! I am Yarden, an iOS engineer for Material Design—Google's open-source system for designing and building excellent user interfaces. I help build and maintain our iOS components, but I'm also the engineering lead for Material's shape system. You can't have a UI without shape. Cards, buttons, sheets, text fields—and just about everything else you see on a screen—are often displayed within some kind of "surface" or "container." For most of computing's history, that's meant rectangles. Lots of rectangles. But the Material team knew there was potential in giving designers and developers the ability to systematically apply unique shapes across all of our Material Design UI components. Rounded corners! Angular cuts! For designers, this means being able to create beautiful interfaces that are even better at directing attention, expressing brand, and supporting interactions. For developers, having consistent shape support across all major platforms means we can easily apply and customize shape across apps. My role as engineering lead was truly exciting—I got to collaborate with our design leads to scope the project and find the best way to create this complex new system. Compared to systems for typography and color (which have clear structures and precedents like the web's H1-H6 type hierarchy, or the idea of primary/secondary colors) shape is the Wild West. It's a relatively unexplored terrain with rules and best practices still waiting to be defined. To meet this challenge, I got to work with all the different Material Design engineering platforms to identify possible blockers, scope the effort, and build it! 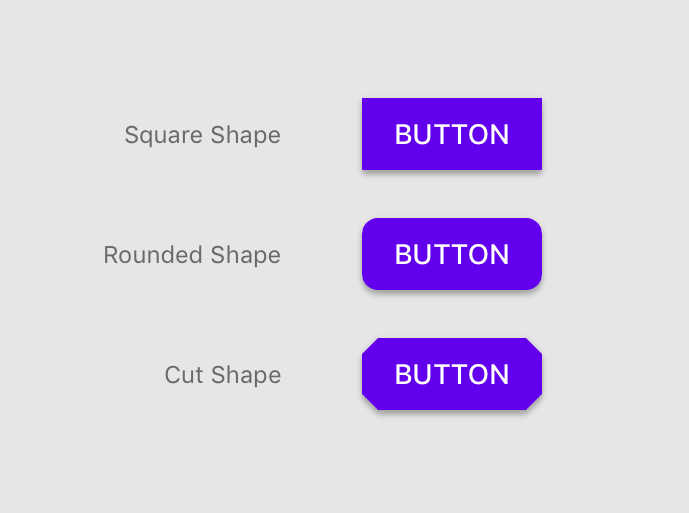 Adding shape support for our components—giving developers the ability to customize the shape of buttons, cards, chips, sheets, etc. Defining and developing a good way to theme our components using shape—so developers could set their product's shape story once and have it cascade through their app, instead of needing to customize each component individually. From an engineering perspective, adding shape support held the bulk of the work and complexities, whereas theming had more design-driven challenges. In this post, I'll mostly focus on the engineering work and how we added shape support to our components. Our first task was to scope out two questions: 1) What is shape support? and 2) What functionality should it provide? Initially our goals were somewhat ambitious. The original proposal suggested an API to customize components by edges and corners, with full flexibility on how these edges and corners look. We even thought about receiving a custom .png file with a path and converting it to a shaped component in each respective platform. We soon found that having no restrictions would make it extremely hard to define such a system. More flexibility doesn't necessarily mean a better result. For example, it'd be quite a feat to define a flexible and easy API that lets you make a snake-shaped FAB and train-shaped cards. But those elements would almost certainly contradict the clear and straightforward approach championed by Material Design guidance. This truck-shaped FAB is a definite "don't" in Material Design guidance. We had to weigh the expense of time and resources against the added value for each functionality we could provide. To solve these open questions we decided to conduct a full weeklong workshop including team members from design, engineering, and tooling. It proved to be extremely effective. Even though there were a lot of inputs, we were able to hone down what features were feasible and most impactful for our users. Our final proposal was to make the initial system support three types of shapes: square, rounded, and cut. These shapes can be achieved through an API customizing a component's corners. Anyone who's built for multiple platforms knows that consistency is key. But during our workshop, we realized how difficult it would be to provide the exact same functionality for all our platforms: Android, Flutter, iOS, and the web. Our biggest blocker? Getting cut corners to work on the web. Unlike sharp or rounded corners, cut corners do not have a built-in native solution on the web. Our web team looked at a range of solutions—we even considered the idea of adding background-colored squares over each corner to mask it and make it appear cut. Of course, the drawbacks there are obvious: Shadows are masked and the squares themselves need to act as chameleons when the background isn't static or has more than one color. Our UI components use shadows to display elevation and the new canvas shadows look different than the native CSS box-shadow, which would require us to reimplement shadows throughout our system. Our UI components also display a visual ripple effect when being tapped—to show intractability. For us to continue using ripple in the paint worklet, we would need to reimplement it, as there is no cross-browser masking solution that doesn't provide significant performance hits. Even if we'd decided to add more engineering effort and go down the Houdini path, the question of value vs cost still remained, especially with Houdini still being "not ready" across the web ecosystem. Based on our research and weighing the cost of the effort, we ultimately decided to move forward without supporting cut corners for web UIs (at least for now). But the good news was that we have spec-ed out the requirements and could start building! In iOS, the basic building block of user interfaces is based on instances of the UIView class. Each UIView is backed by a CALayer instance to manage and display its visual content. By modifying the CALayer's properties, you can modify various properties of its visual appearance, like color, border, shadow, and also the geometry. When we refer to a CALayer's geometry, we always talk about it in the form of a rectangle. Its frame is built from an (x, y) pair for position and a (width, height) pair for size. The main API for manipulating the layer's rectangular shape is by setting its cornerRadius, which receives a radius value, and in turn sets its four corners to be rounded by that value. The notion of a rectangular backing and an easy API for rounded corners exists pretty much across the board for Android, Flutter, and the web. But things like cut corners and custom edges are usually not as straightforward. To be able to offer these features we built a shape library that provides a generator for creating CALayers with specific, well-defined shape attributes. Thankfully, Apple provides us with the class CAShapeLayer, which subclasses CALayer and has a customPath property. Assigning this property to a custom CGPath allows us to create any shape we want. An MDCShapeGenerating for creating shaped rectangular CGPaths. By default MDCRectangleShapeGenerator creates rectangular CGPaths. Set the corner and edge treatments to shape parts of the generated path. The corner treatments to apply to each corner. The offsets to apply to each corner. The edge treatments to apply to each edge. Convenience to set all corners to the same MDCCornerTreatment instance. Convenience to set all edge treatments to the same MDCEdgeTreatment instance. By providing such an API, a user can generate a path for only a corner or an edge, and the MDCRectangleShapeGenerator class above will create a shape with those properties in mind. For this initial implementation of our initial shape system, we used only the corner properties. The value of the corner (each specific corner type receives a value). Whether the value provided is a percentage of the height of the surface or an absolute value. A method that returns a path generator based on the given value and corner type. This will provide MDCRectangleShapeGenerator a way to receive the right path for the corner, which it can then append to the overall path of the shape. To make things even simpler, we didn't want our users to have to build the custom corner by calculating the corner path, so we provided 3 convenient subclasses for our MDCCornerTreatment that generate a rounded, curved, and cut corner. As an example, our cut corner treatment receives a value called a "cut"—which defines the angle and size of the cut based on the number of UI points starting from the edge of the corner, and going an equal distance on the X axis and the Y axis. If the shape is a square with a size of 100x100, and we have all its corners set with MDCCutCornerTreatment and a cut value of 50, then the final result will be a diamond with a size of 50x50. From the starting point of (0, radius) we draw an arc of a circle to the point (sin(angle) * radius, cos(angle) * radius) which—similarly to the cut example—translates to (radius, 0). Lastly, the radius value is the radius of the arc. After providing an MDCRectangleShapeGenerator with the convenient APIs for setting the corners and edges, we then needed to add a property for each of our components to receive the shape generator and apply the shape to the component. Each supported component now has a shapeGenerator property in its API that can receive an MDCShapeGenerator or any different shape generator that implements the pathForSize method: Given the width and height of the component, it returns a CGPath of the shape. We also needed to make sure that the path generated is then applied to the underlying CALayer of the component's UIView for it to be displayed. Because the shadows, borders, and background colors are part of the default UIView API and don't necessarily take into account custom CALayer paths (they follow the default rectangular bounds), we needed to provide additional support. So we implemented MDCShapedShadowLayer to be the view's main CALayer. What this class does is take the shape generator path, and then passes that path to be the layer's shadow path—so the shadow will follow the custom shape. It also provides different APIs for setting the background color and border color/width by explicitly setting the values on the CALayer that holds the custom path, rather than invoking the top level UIView APIs. As an example, when setting the background color to black (instead of invoking UIView's backgroundColor) we invoke CALayer's fillColor. Because the shape's layer is set up differently than the view's default layer, we need to be conscious of places where we set our layer's properties in our existing component code. As an example, setting the cornerRadius of a component—which is the default way to set rounded corners using Apple's API—will actually not be applicable if you also set a custom shape. Receiving touch also applies only on the original rectangular bounds of the view. With a custom shape, we'll have cases where there are places in the rectangular bounds where the layer isn't drawn, or places outside the bounds where the layer is drawn. So we needed a way to support proper touch that corresponds to where the shape is and isn't, and act accordingly. As with the other properties, our ink ripple (which provides a ripple effect to the user as touch feedback) is also built on top of the default rectangular bounds. For ink, there are two things we update: 1) the maxRippleRadius and 2) the masking to bounds. The maxRippleRadius must be updated in cases where the shape is either smaller or bigger than the bounds. In these cases we can't rely on the bounds because for smaller shapes the ink will ripple too fast, and for bigger shapes the ripple won't cover the entire shape. The ink layer's maskToBounds needs to also be set to NO so we can allow the ink to spread outside of the bounds when the custom shape is bigger than the default bounds. // Despite referencing circles and radii, this means "make all corners 4.0". I'm really excited to have tackled this problem and have it be part of the Material Design system. I'm particularly happy to have worked so collaboratively with design. As an engineer, I tend to tackle problems more or less from similar angles, and also think about problems very similarly to other engineers. But when solving problems together with designers, it feels like the challenge is actually looked at from all the right angles (pun intended), and the solution often turns out to be better and more thoughtful. We're in good shape to continue growing the Material shape system and offering even more support for things like edge treatments and more complicated shapes. One day (when Houdini is ready) we'll even be able to support cut corners on the web. Please check our code out on GitHub across the different platforms: Android, Flutter, iOS, Web. And check out our newly updated Material Design guidance on shape. The magic of augmented reality is in the way it blends the digital and the physical worlds. For AR experiences to feel truly immersive, digital objects need to look realistic -- as if they were actually there with you, in your space. This is something we continue to prioritize as we update ARCore and Sceneform, our 3D rendering library for Java developers. Today, with the release of ARCore 1.6, we're bringing further improvements to help you build more realistic and compelling experiences, including better plane boundary tracking and several lighting improvements in Sceneform. With 250M devices now supporting ARCore, developers can bring these experiences to an even larger and growing user base. Previous versions of Sceneform defaulted to optimizing ambient light as yellow. Version 1.6 defaults to neutral and white. 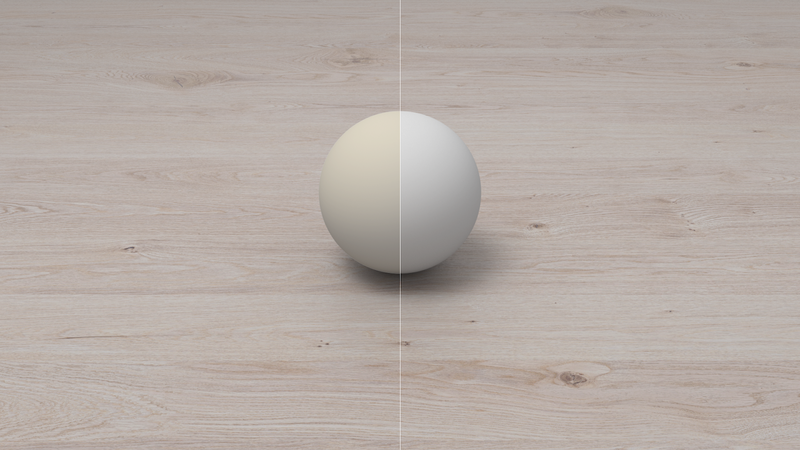 This aligns more closely to the way light appears in the real world, making digital objects look more natural. You can see the differences below. This change will also make objects rendered with Sceneform look as if they're affected more naturally by color and lighting in the surrounding environment. For example, if you're viewing an AR object at sunset, it would appear to be illuminated by the red and orange hues, just like real objects in the scene. In addition, we've updated Sceneform's built-in environmental image to provide a more neutral scene for your app. This will be most noticeable when viewing reflections in smooth metallic surfaces. To help you further improve quality and engagement in your AR apps, we're adding screen capture and recording to Sceneform. This is something a number of developers have requested to help with demo recording and prototyping. It can also be used as an external facing feature, allowing your users to share screenshots and videos on social media more easily, which can help get the word out about your app. You can access this functionality through the surface mirroring API for the SceneView class. The API allows you to display the Sceneform view on a device's screen at the same time it's being rendered to another surface (such as the input surface for the Android MediaRecorder). The new updates to Sceneform and ARCore are available today. With these new versions also comes support for new devices, such as the Samsung Galaxy A3 and the Huawei P20 Lite, that will join the list of ARCore-enabled devices. More information is available on the ARCore developer website. If you're looking to make Google Drive files accessible from within your application, chances are you might use the Google Drive REST API or the Google Drive Android API to help. Both tools allow users to download or upload files from Drive from inside of another application. 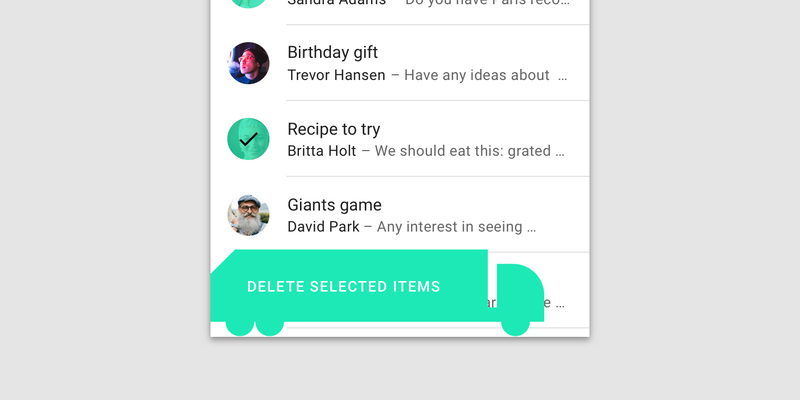 Starting today, we're simplifying options for developers by retiring the Drive Android API. We will focus solely on expanding functionality for the Drive REST API. Share and collaborate as you expect from Drive. You can manage permissions or prompt the Share dialog to users as needed. The REST API also allows for commenting on files, allowing your app to interact with the conversation around a file. Search for files using files.list, based on traditional indexing or your own customized, indexable text. Also detect changes to files through the Changes collection, and keep track of file changes, including files from Team Drives that have been shared with the user. Export and convert Google Docs so that your app can open a user's document easily. If you use the Google Drive Android API, you will need to migrate your existing applications to other services prior to December 6, 2019, when all calls to the API and any features in your applications that depend on it will be shut down. Note: if you've been using the Drive Android API for its offline sync capability, you can continue to provide an offline-first model by using a SyncAdapter with the Drive REST API. We want to make it easy for you to migrate your applications to use the Drive REST API. To get started, reference this migration guide which details replacements for each of the major services fulfilled by the Drive Android API. Additionally, check out this sample app, which demonstrates each of these proposed replacements. If you have any issues, check out the google-drive-sdk tag on StackOverflow. 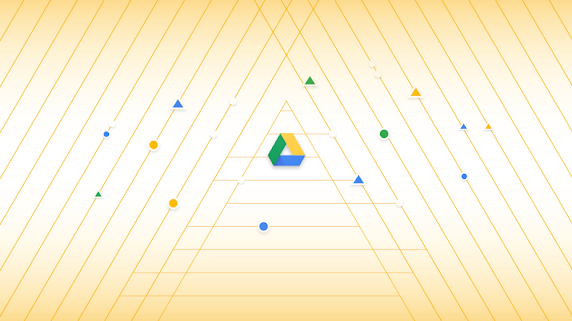 Today, we are announcing a new version of the Google Drive Activity API, used to access the record of user activity in Google Drive. 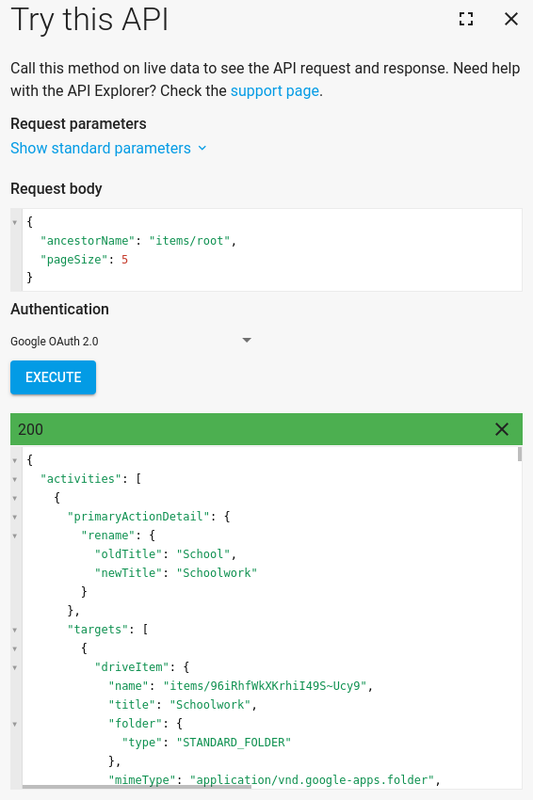 This new API offers an expanded data model to provide meaningful representations of actions, actors, and targets of activity in Google Drive. It also offers new features for filtering the results of requests made to the API. The version of the API released today replaces the existing Drive Activity API v1, so you should migrate your applications to the new version of the API soon. We will shut down the v1 API on December 31, 2019. At that time, any application that depends on the v1 API will no longer work. A migration guide is available to help with this transition to the new Drive Activity API v2. You may also want to read the overview and guides for the new version, peruse the reference documentation, or jump right in and try it out in the APIs Explorer. 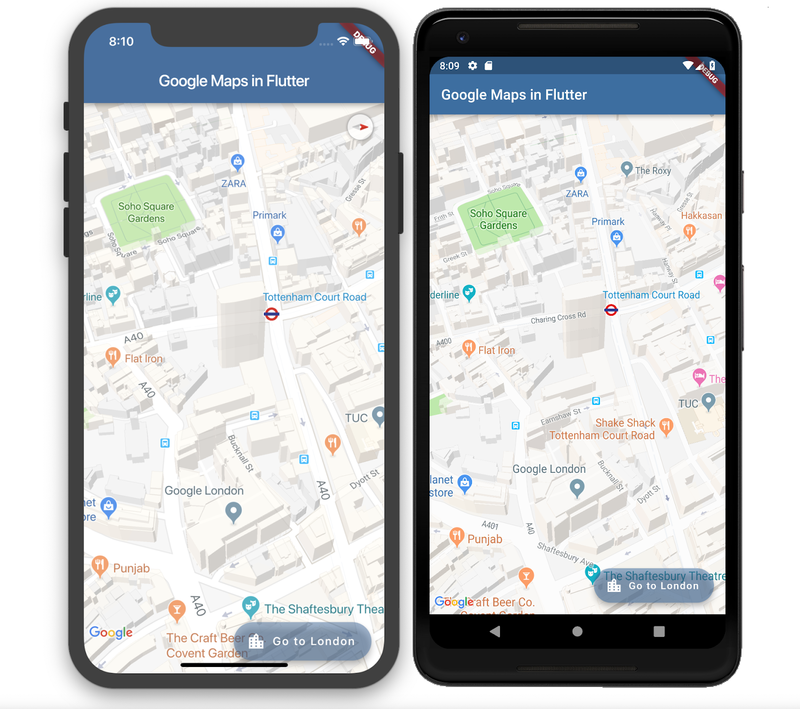 Today, at Flutter Live, we're announcing Flutter 1.0, the first stable release of Google's UI toolkit for creating beautiful, native experiences for iOS and Android from a single codebase. Cross-platform mobile development today is full of compromise. Developers are forced to choose between either building the same app multiple times for multiple operating systems, or to accept a lowest common denominator solution that trades native speed and accuracy for portability. With Flutter, we believe we have a solution that gives you the best of both worlds: hardware-accelerated graphics and UI, powered by native ARM code, targeting both popular mobile operating systems. Flutter doesn't replace the traditional Apple and Android app models for building mobile apps; instead, it's an app engine that you can either embed into an existing app or use for an entirely new app. Flutter enables you to build beautiful apps. We want to enable designers to deliver their full creative vision without being forced to water it down due to limitations of the underlying framework. Flutter lets you control every pixel on the screen, and its powerful compositing capabilities let you overlay and animate graphics, video, text and controls without limitation. Flutter includes a full set of widgets that deliver pixel-perfect experiences on both iOS and Android. And it enables the ultimate realization of Material Design, Google's open design system for digital experiences. Flutter is fast. It's powered by the same hardware-accelerated Skia 2D graphics engine that underpins Chrome and Android. We architected Flutter to be able to support glitch-free, jank-free graphics at the native speed of your device. Flutter code is powered by the world-class Dart platform, which enables compilation to native 32-bit and 64-bit ARM code for iOS and Android. Flutter is productive. Flutter introduces stateful hot reload, a revolutionary new capability for mobile developers and designers to iterate on their apps in real time. With stateful hot reload, you can make changes to the code of your app and see the results instantly without restarting your app or losing its state. Stateful hot reload transforms the way developers build an app -- and in user surveys, developers say it makes their development cycle three times more productive. Lastly, Flutter is open. Flutter is an open source project with a BSD-style license, and includes the contributions of hundreds of developers from around the world. In addition, there's a vibrant ecosystem of thousands of plug-ins. And because every Flutter app is a native app that uses the standard Android and iOS build tools, you can access everything from the underlying operating system, including code and UI written in Kotlin or Java on Android, and Swift or Objective-C on iOS. 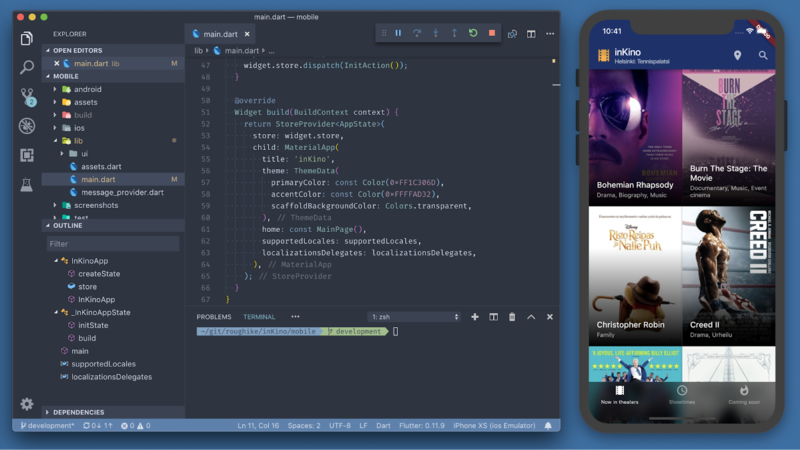 Put this all together, combine it with best-in-class tooling for Visual Studio Code, Android Studio, IntelliJ or the programmer's editor of your choice, and you have Flutter -- a development environment for building beautiful native experiences for iOS or Android from a single codebase. We announced the first beta of Flutter at Mobile World Congress ten months ago, and we've been excited to see how quickly it has been adopted by the broader community, as evidenced by the thousands of Flutter apps that are already published to the Apple and Google Play stores even before our 1.0 release. It's clear that developers are ready for a new approach to UI development. Internally, Flutter is being used at Google for a wide array of products, with Google Ads already having switched to Flutter for their iOS and Android app. And even before 1.0, a wide range of global customers including Abbey Road Studios, Alibaba, Capital One, Groupon, Hamilton, JD.com, Philips Hue, Reflectly, and Tencent are developing or shipping apps with Flutter. "We are excited by Flutter's unique take on high-performing cross-platform development. Our engineers have appreciated the rapid development promise and hot reload capabilities, and over the past year we have seen tremendous progress in the framework and especially the native integration story. "Flutter can allow Capital One to think of features not in an 'iOS or Android-first' fashion, but rather in a true mobile-first model. We are excited to see Flutter 1.0 and continue to be impressed with the pace of advancement and the excitement in the engineering community." At the Flutter Live event today, the popular payment service Square announced two new Flutter SDKs that make it easy to accept payments for goods and services with Flutter, whether in-person using a Square payment reader or by taking payments inside a mobile app. 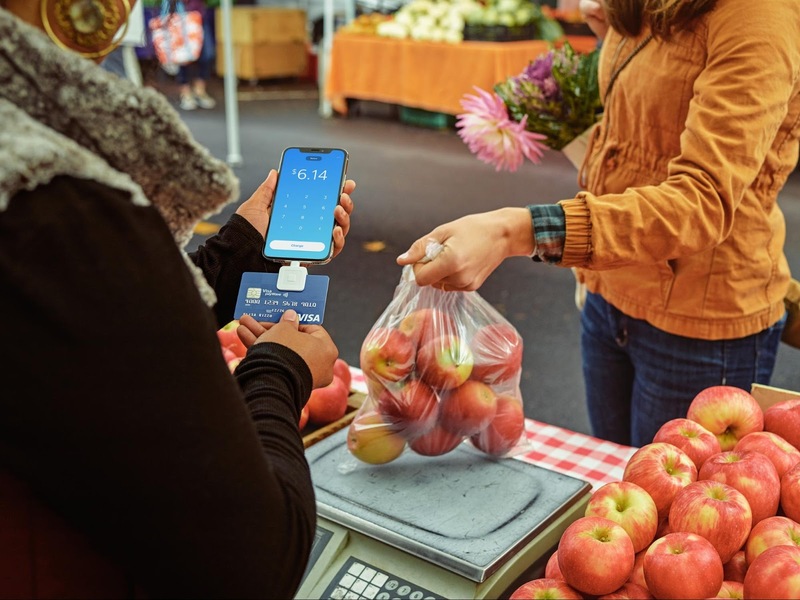 Square demonstrated an example of using their payments SDK using an app from Collins Family Orchards, a family farm that grows and sells fruit in farmers markets around the Pacific Northwest. "I was blown away by the speed of all the animations and transitions in production builds. As a web developer, it was super easy to make the transition to Flutter, and I can't believe I was able to build a fully working app that can take payments in just a week." Also at Flutter Live, 2Dimensions announced the immediate availability of Flare, a remarkable new tool for designers to create vector animations that can be embedded directly into a Flutter app and manipulated with code. Flare eliminates the need to design in one app, animate in another, then convert all of that to device-specific assets and code. Animations built with Flare can be embedded into an existing Flutter app as a widget, allowing them to participate in the full compositor and be overlaid with other text, graphical layers or even UI widgets. Integrating in this way frees animations from the 'black box' limitations of other architectures, and allows ongoing collaboration between designers and developers right up to the completion of the app. Such tight integration between Flutter and Flare provides a uniquely compelling offering for digital designers and animators who want to create highly-polished mobile experiences. Another partner who has bet on Flutter is Nevercode, a fast-growing provider of continuous integration and delivery (CI/CD) tooling for mobile apps. At Flutter Live, they announced Codemagic, a new tool designed specifically for Flutter to make it easy to automate the process of building and packaging Flutter apps for both Android and iOS from a single automation. Available today in beta, Codemagic allows you to select a GitHub repo containing a Flutter project, and with just a few clicks, create continuous build flows that run tests, and generate binary app bundles that you can upload to the Apple and Google Play stores. Since the first beta, we've been working to add features and polish to Flutter. In particular, we rounded out our support for pixel-perfect iOS apps with new widgets; added support for nearly twenty different Firebase services; and worked on improving performance and reducing the size of Flutter apps. We've also closed out thousands of issues based on feedback from the community. While the primary focus of the 1.0 release is bug fixes and stabilization, we're also introducing previews of two major new features for developers to try out in preview mode that we anticipate will ship in our next quarterly release in February 2019: Add to App and platform views. When we first built Flutter, we focused on productivity for the scenario where someone is building a new application from scratch. But of course, not everyone has the luxury of being able to start with a clean slate. Talking to some of our larger customers, it was clear that they wanted to use Flutter for new user journeys or features within an existing application, or to convert their existing application to Flutter in stages. The architecture of Flutter supports this model well: after all, every Flutter app includes a host Android and iOS container. But we've been working to make it easier to incrementally adopt Flutter by updating our templates, tooling and guidance for existing apps. We've made it easier to share assets between Flutter and host code. And we've also reworked the tooling to make it easy to attach to an existing Flutter process without launching the debugger with the application. We will continue to work to make this experience even better. Even though a number of customers are already using our guidance on Add to App successfully, we're continuing to add samples and expand support for complex scenarios. In the meantime, our instructions for adding Flutter to existing apps are on our wiki, and you can track the remaining work on the GitHub project board. While Add To App is useful as a way to gradually introduce Flutter to an existing application, sometimes it's useful to go the other way round and embed an Android or iPhone platform control in a Flutter app. So we've introduced platform view widgets (AndroidView and UiKitView) that let you embed this kind of content on each platform. We've been previewing Android support for a couple of months, but now we're expanding support to iOS, and starting to add plug-ins like Google Maps and WebView that take advantage of this. Like other components, our platform view widgets participate in the composition model, which means that you can integrate it with other Flutter content. For example, in the screenshot above, the floating action button in the bottom right corner is a Flutter widget that has background color with 50% alpha. This demonstrates the unique architectural advantages of Flutter well. While this work is ready for developers to try out, we're continuing to work on improving performance and device compatibility, so we recommend caution if deploying apps that depend on PlatformViews. We're continuing to actively optimize platform views and expect them to be ready for production in time for our next quarterly update. The primary target for Flutter has so far been iOS and Android. Yet our ambitions for Flutter extend beyond mobile to a broader set of platforms. Indeed, from the outset Flutter was architected as a portable UI toolkit that is flexible enough to go wherever pixels are painted. Some of this work has already been taking place in the open. Flutter Desktop Embedding is an early-stage project that brings Flutter to desktop operating systems including Windows, MacOS, and Linux. We also recently published informal details of using Flutter on Raspberry Pi, as a way to demonstrate Flutter embedding support to smaller-scale devices that may not include a full desktop environment. This week, at Flutter Live, we gave the first sneak peek of an experimental project we're working on in the labs that significantly expands where Flutter can run. We have a separate blog article on Medium that describes the technical implementation details of Hummingbird. And we'll have a lot more to share on Hummingbird at Google I/O in 2019: hope to see you there! Of course, mobile remains our immediate priority, and you can expect to see the bulk of our investment in these core mobile scenarios over the coming months. With the release of Flutter 1.0, we've established a new 'stable' channel, in addition to the existing beta, dev, and master channels. The stable channel updates less often than other channels, but we have a higher confidence in its quality since builds have already been vetted through the other channels. We anticipate that we'll update our stable channel on a quarterly basis with our most battle-tested builds. You can download Flutter 1.0 from our website at https://flutter.io, where you can also find documentation for developers transitioning from other frameworks, code labs, a cookbook of common samples, and technical videos. We owe a particular debt to the early adopters who have joined us on the journey so far, providing feedback, identifying issues, creating content, and generally shaping the product. The Flutter community is one of our greatest assets as a project: a welcoming, diverse, helpful group of individuals who volunteer selflessly because they also care about this open source project. Thank you! Flutter is ready for you. What will you build?